As part of the Cuddly Buddly pre-release team I get the chance to work with the images before they are available on-line, and this past week I was given one of Karen Middleton's images that is available for purchase now. This elegant image is "Holly and Ivy" and was printed out on water color paper, painted with Tim Holtz Distress Inks, and then I did the burnished velvet technique with a clear glitter. The image was cut with a Spellbinders Scalloped Oval, popped up with foam dots onto the dp which is from Basic Grey's Figgy collection. The dies were all cut with Tim Holtz's Festive Greenery, and rhinestones from my stash added the final touch. 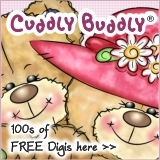 Cuddly Buddly is also giving away over 100 free digital images from their archives so hop on over to the store and check out the super cute digis. 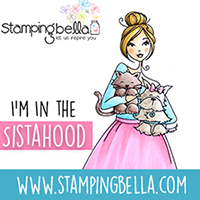 While you're there also check out the newest releases and all of the other wonderful products that you can purchase from this awesome on-line store. Gorgeous card Shari, the image is beautiful. I love the addition of the red gems as berries on the die cut leaves. Lovely work, the colours are really striking. 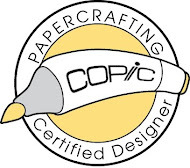 Thanks so much for sharing with us at Crafty Cardmakers this week.